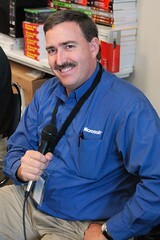 Tim Landgrave is an architect with the consulting division of Microsoft, based out of Louisville, KY. This is the second in our series of interviews from the IndyTechfest in Indianapolis, IN. Tim spends a lot of time talking with customers about how to get the most of the .NET framework and other Microsoft technologies, and we spent a few minutes with him discussing the current state of the framework. You can check out Tim's blog at http://timlandgrave.com. The staff at The Thirsty Developer would like to thank the people who have helped make this podcast even better by allowing us to use some of their created works in delivering the show. The show's intro music is a song called Backing In and the show's closing music is a song called Large Deposits. Both of these works are by Pete Prodoehl (aka Raster) and are distributed under the Creative Commons Attribution License. The Thirsty Developer logo is an original work by Erik Klimczak of Clarity Consulting. This work is also distributed under the Creative Commons Attribution License. Chad Campbell is a software developer with Crowe Chizek, based out of Louisville, KY. We met up with Chad a few weeks ago at the IndyTechfest in Indianapolis, IN, where he was set to give a talk called "Silverlight on Every page". We caught up with him at the speaker's room and asked him to talk about his technique for using Silverlight 1.1. 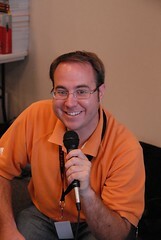 You can Check out Chad's blog for more thoughts and Silverlight at http://cornucopia30.blogspot.com/.